The park contains only 9.25 acres but remains one of the most heavily used parks with a multitude of facilities for individuals of all ages. There are 3 lighted basketball courts, a lighted outdoor pool with a wading area and bath house, a recreation building with restrooms and a playground area. The sloping land drops suddenly and spectacularly to a level plain far below where a regulation softball field, a basketball court and a multi-use field are located. The land was deeded to the City in 1926 by Paul Goodloe McIntire to be used as a public park and playground. 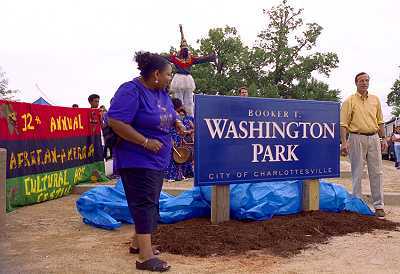 Washington Park is one of seven case studies in the 1998 publication The City As a Park, A Citizens' Guide to Charlottesville Parks, which is available for purchase from the Parks and Grounds Division. City Recreation and Leisure Services has contact information on the recreation center here. Washington Park is the site for the Annual African-American Cultural Arts Festival every summer (2001 photo gallery). The new playground and picnic shelter were given to the City by the Dave Matthews Band. The drainage, seeding and grading for the third phase of the Washington Park renovations were funded by a generous grant by the Perry Foundation. The park is open 6AM to 9PM. There are parking lots at both upper and lower levels.